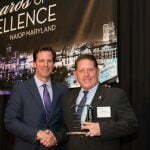 MacKenzie Contracting Company was recently recognized at NAIOP Maryland’s Bi-Annual Awards of Excellence Gala, receiving the award for Best Interior Rehab for work completed at Baltimore engineering firm RK&K’s new headquarter location in Baltimore City. The project consisted of a complete renovation and buildout of 116,000 total square feet between two floors located at 200 E. Pratt Street in the heart of downtown Baltimore’s harbor. Scott Albright, Senior Vice President for MacKenzie Contracting led the project and accepted the award on behalf of his team. This new location for RK&K represented a consolidation of three of their Baltimore offices into one, providing the opportunity to bring everyone together again and positioning the firm conveniently to their workforce. MacKenzie Contracting collaborated for two years with RK&K to complete the renovation which included numerous high-end finishes, some of which required special engineering components; a concrete reception area, a rebar wall, guardrails at the staircase, and gabion baskets in the lobby. Having a tight schedule for completion, work had to be organized precisely between multiple schedules of parties involved; that of the tenant that was vacating, and leasing constraints from RK&K’s multiple city locations that were to be vacated. NAIOP is the nation’s leading trade association for developers, owners, investors and other professionals in industrial, office and mixed-use commercial real estate. Comprising 19,000 members in 55 chapters, it provides networking opportunities, educational programs, research on trends and innovations and strong legislative representation. With more than 420 members, NAIOP Maryland’s bi-annual awards program celebrates and recognizes the innovative achievements of regional commercial real estate developers, as well as companies and professionals that service the industry in Maryland. For more information on MacKenzie Contracting Company, LLC, please visit www.mackenziecontracting.com.